About PRL Info Systems Inc.
Pimarc software was born - quite literally - on the shop floor, from the real world information needs of Holstead & Redmond Limited, a land survey company with a heritage spanning more than five decades. Holstead & Redmond Limited works day to day with engineers, architects and construction companies. 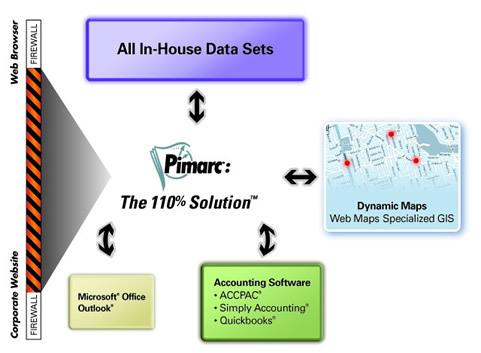 The relationship with these types of businesses has been built into PIMARC's design. When Holstead & Redmond needed a solution to better manage and access a large and growing survey record index (SRI), the company principals set about creating software on their own to solve the problem. From this initial concept, the software went through expansion and refinement, and was made commercially available in 2004, to the delight of other land surveying companies that were experiencing similar challenges. Today, Pimarc software products are used by land surveyors, architects and engineers across Canada and in the U.S.
Holstead & Redmond continues to serve as the 'live laboratory' and testing ground for all new features and enhancements to the Pimarc software suite, ensuring that Pimarc project management software products meet the needs of land surveyors, engineers, architects in the real world.